Who says a BLT has to be a sandwich? This pretty salad turns its back on convention and makes a great lunch or light dinner. Coarsely crumble bacon and set aside. 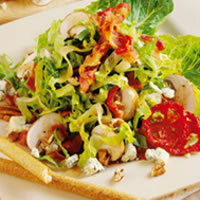 In large bowl, toss together romaine, tomatoes and mushrooms. Whisk together olive oil, vinegar, sugar and seasonings; toss with salad mixture and divide evenly among four dinner plates. Top each salad with some bacon and sliced green onion. Serving Suggestion: Serve with cornbread and a tall glass of ice tea.